This book explores the underlying causes of the pervasive dominance of ‘unethics’ in contemporary affairs in economics, business, and society. It is argued that the state of unethics is related to the overexpansion of market and market values in all spheres of social life and human activities. A correlate of this development is the emergence of an extremely individualistic, materialistic and narcissistic mind-set that dictates the decisions and behavior of people and organizations. The author argues that art can help to overcome the dominant market metaphysics of our age, as genuine art creates models of 'poetic dwelling,' which can generate non-linear, progressive change that opens up a larger playing field for ethics. Aesthetics and ethics go hand in hand. Ethical action is not just right for its own sake, but makes the world a richer, livable and more beautiful place. Ethics, Meaning, and Market Society will be of interest to students at an advanced level, academics, researchers and professionals. 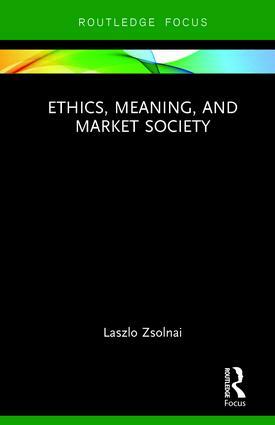 It addresses the topics with regard to ethics in economics, business, and society in a contemporary context. Laszlo Zsolnai is Professor and Director of the Business Ethics Center at the Corvinus University of Budapest, Hungary. He also serves as President of the European SPES Institute in Leuven, Belgium.